The distributors of Curcumall® in North America are pleased to announce that the official Curcumall® online store has been upgraded and their logistics platform in the USA has been expanded. “We are excited to announce the upgrading of http://www.curcum-all.com, the Official Curcumall® Online Store” stated Aviva Rabinovich, the co-developer of the concentrated turmeric supplement. Curcumall's® Online Store - http://www.curcum-all.com, was opened less than a year ago. “We are overwhelmed with the market’s positive response to our product in the US - we simply had to upgrade our sales back office as well as our logistics setup in the US in order to keep up with the demand” indicated Dor Geffen, Operations Manager at http://www.curcum-all.com. 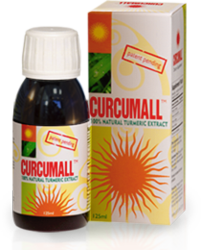 Curcumall® is an innovative high absorption liquid extract of Turmeric and concentrated Curcumin C3®. The product was developed for over five years by health and medical scientists, and has been in the market since early 2007. Studies have shown that Curcumin has outstanding antioxidant and anti-inflammatory capabilities, offering numerous health benefits (http://www.curcum-all.com/turmeric-health-benefits.html). Almost 2,000 scientific research papers have been published on Curcumin, which has been found to regulate numerous molecular targets and pathways that are linked to inflammation. The natural anti-inflammatory activity of Curcumin is comparable in strength to steroidal drugs without the side effects of the later. Clinical trials of Curcumin as well as centuries of human use have shown that Curcumin intake is beneficial, safe, and does not present side-effects.